Online retailer With Love, From Brooklyn is raising money to send out monthly subscription boxes filled with the borough's artisanal treats. BROOKLYN — Fans of handmade fare may soon get some Brooklyn flavor in their mailboxes. Online retailer, With Love, From Brooklyn, hopes to raise $15,000 to launch monthly artisanal subscription boxes featuring the borough’s small batch treats. The site features more than 20 local vendors, including Williamsburg’s Mast Brothers Chocolate, caramel makers Spoonable and Prospect Heights’ Empire Mayonnaise. Customers can order curated gift sets or choose from more than 100 individual products ranging from grass-fed beef jerky to organic jam. After launching the online platform in 2011 during the “early flowering of the artisan renaissance,” sending out subscription boxes was a natural next step, said founder and CEO Dara Furlow. 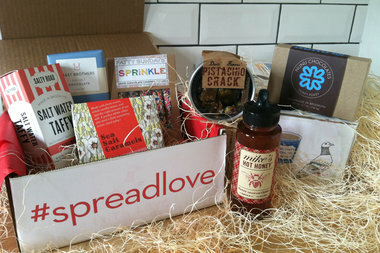 Each “#spreadlove” set will come with up to eight items from local makers. A small sample box would cost around $30, while a deluxe assortment is priced at $75. In addition to providing artisanal goods for foodies, Furlow said the subscriptions will also help promote Brooklyn businesses. “The idea is we’re going to spread Brooklyn love all across the country and around the world,” she added. If funded, packaging for the boxes will spotlight illustrations from local artist Claudia Pearson and feature designs like the city’s iconic blue-and-white coffee cup. A monthly theme will determine the offerings, which may include home goods items like cutting boards and tea towels. “The artisanal movement is something that’s not going away,” Furlow said. “People want something unique and different. Coming from Brooklyn, this is the real deal."